"It's fly time!" jett is a friendly, playful plane and really fast on the hit preschool show! he gets along with everyone at world airport and loves to travel and deliver packages to kids around the world. When jett’s missions run into trouble, jett calls his best friends, the Super wings! this set includes two transforming vehicles: jett’s Super robot suit and 5” scale transforming jet. jett’s Super robot suit – easily transforms from a free-wheeling vehicle to a free-standing figure that can conquer the toughest problems! at over 14” tall with real working ladder and wheels, jett’s Super robot suit lights up and says 6 familiar phrases from the show with the press of a button. 5” scale transforming jet figure – transforms from vehicle to Bot in 10 easy steps and easily fits in the cab of the Super robot suit. experience all of jett's adventures together! recreate your favorite scenes from the show or use your imagination to create all new scenarios! batteries required: 2x AAA (included). on the hit preschool show, the Super Wings team is ready to take on any job – big or small – whether it involves navigating the Rocky boulders of a VOLCANO, delivering a Tracker or helping to Chase and capture a loose pack of Pups, the Super Wings are always on Patrol. with the help of sky from the world airport tower, the team is always on the lookout for kids in need of help. As vehicles or robots, the team is always ready to transform and use teamwork on any mission to rescue, help and teach kids that there is a solution for everything. super wings, we deliver! Time for a Super upgrade! this set includes two transforming toy vehicles: jett's Super robot suit and 5" scale transforming jett figure. Jetty Super robot suit - easily transforms from a free-wheeling vehicle to a free-standing figure that can conquer the toughest problems! 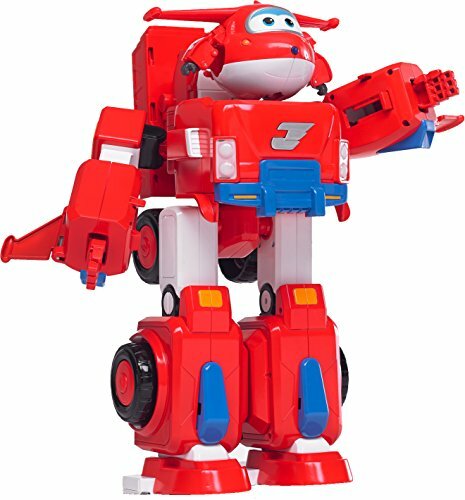 at over 14" tall with real working ladder and wheels, jett's Super robot suit lights up and says 6 familiar phrases from the show with the press of a button. 5" scale transforming jett figure - transforms from vehicle to Bot in 10 easy steps and easily fits in the cab of the Super robot suit. Jetty Super robot suit and 5" transforming jett figure are for kids ages 3+. Includes 1 jett Super robot suit toy and 1 5" transforming scale jett toy. If you have any questions about this product by Super Wings -, contact us by completing and submitting the form below. If you are looking for a specif part number, please include it with your message.